When we rolled into the Constellation Room on Friday night to catch Lower Dens and No Joy, it was a little disappointing to see so much empty space on the floor. The show had already been downgraded from the larger stage of the Observatory, so we expected the smaller room to be at least somewhat full. 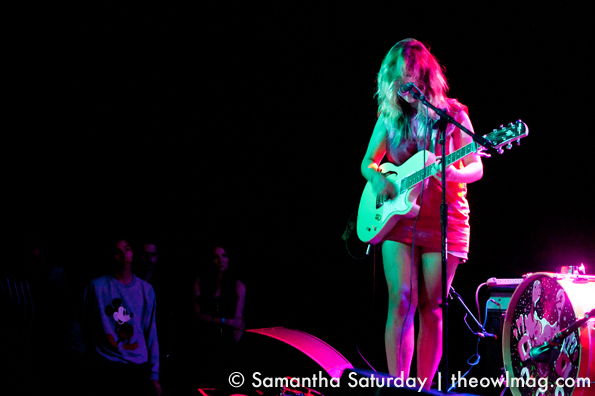 Slowly but surely, however, the empty space began to fill for Montreal’s punk rock shoegaze babes, No Joy. Clad in short shorts and t-shirts with cut off sleeves, the girls were prepared for the Southern California heat, both in fashion and in sound. 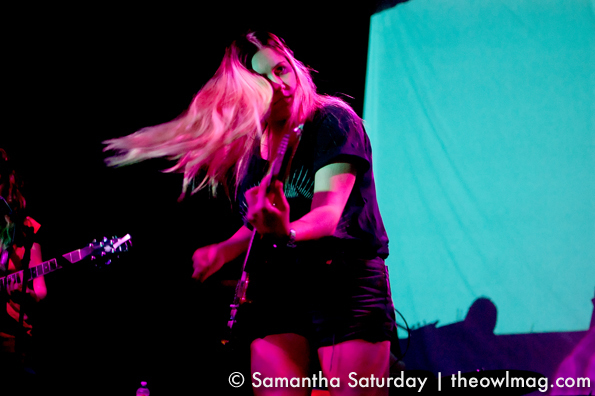 From the very first strum, No Joy laid down an undercurrent of bass, accompanied by stacked guitar and drum rhythms. The trio of girls powered through their set under veils of blonde, mussed up locks, with the occassional peek of an eye to gaze out to the crowd. Although the crowd seemed aloof at the beginning of No Joy’s set, by the end they were clearly won over by their unexpected pop-ish undertones. Between sets the crowd meekly inched closer to the stage, coaxed on by a hypeman prodding “Are you ready to rock! ?” Although this seemed a bit out of context the quartet took to the stage with looks of amusement spanning each of their faces. 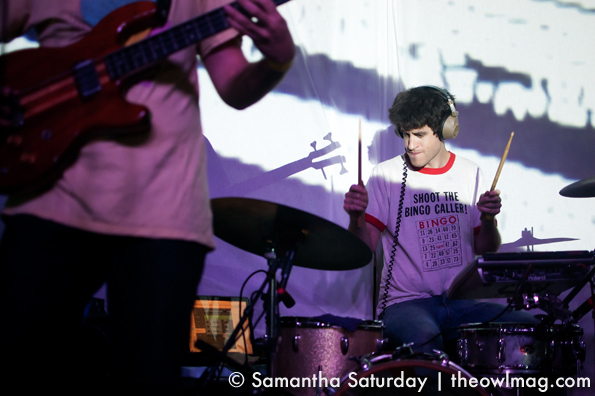 From the start of their set, it was clear that although their music can be at times heavy and introspective, the group is playful and energetic on stage. 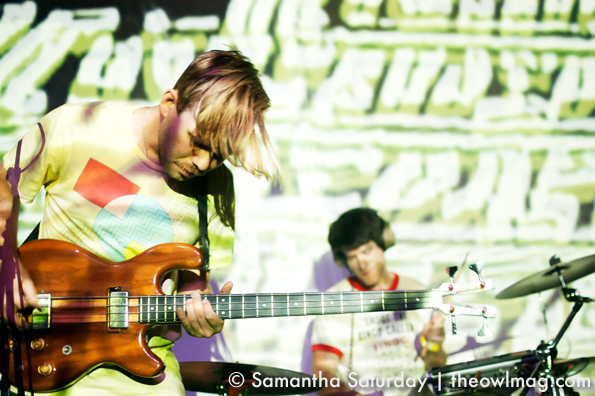 It is that energy that keeps their live performance captivating, even at times when instruments are swirling together in a cacophonous racket. 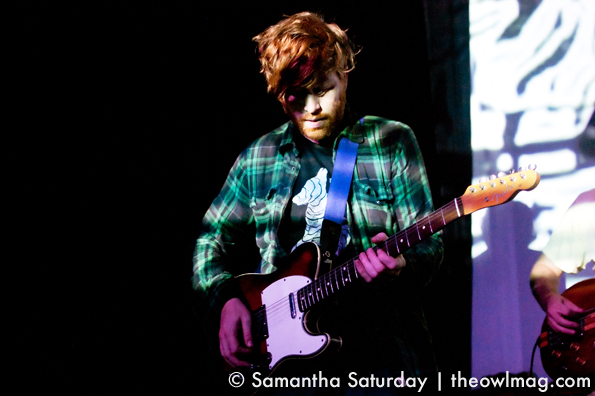 With a well composed balance of songs from the band’s debut Twin-Hand Movement and most recent release Nootropics, the set oscillated smoothly from trippy, shoegazy jams like “Nova Anthem” to tunes with more danceable undertones like “Brains” and the seductive “I Get Nervous”. By the end of their set we noticed the audience in rapt attention, hanging on every spacy note, a pleasant turnaround from how the night started. 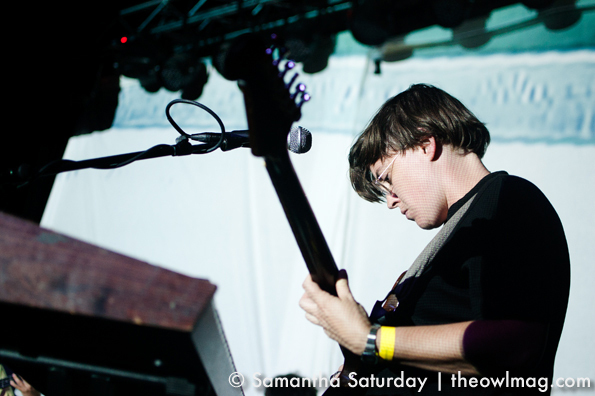 For more photos of Lower Dens and No Joy at The Constellation Room click here.